Senshin Buddhist Temple, 1311 W. 137th St. in Los Angeles, will hold its annual Bon Odori on Saturday, July 5. 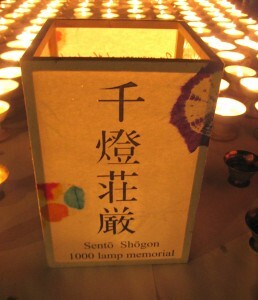 A Hatsubon service for loved ones who have passed away since the last Obon will begin at 5:30 p.m. The Bon Odori, featuring dancers in yukata and happi coats, starts at 7 p.m. Nobuko Miyamoto and Great Leap will perform their Fandango Obon piece “Bambutsu” with Quetzal and the Mottainai Band, and will premiere a new piece, “Ichigo Ichie.” There will be a raffle drawing during intermission. More Obon traditions will be observed at 9 p.m.: Omairi in the Hondo, Sento Shogon (1,000 oil lamps) outside, and otoki in the temple hall. Horaku with Kinnara Taiko will follow at 10 p.m.
For more information, call (323) 731-4617, email [email protected] or visit www.senshintemple.org.